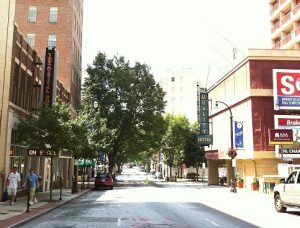 Theatrical Outfit was founded in 1976 and is Atlanta’s second oldest professional theatre company. At its genesis, the Outfit was an ensemble of young theater artists who created original plays that included music, dance, spoken word, and innovative staging. Originally, the Company was housed in a laundromat in Virginia Highlands that was converted into a 99-seat performance space. Notably, Atlanta actor/director David Head was a founding member and one of the first visionary Artistic Directors of Theatrical Outfit. 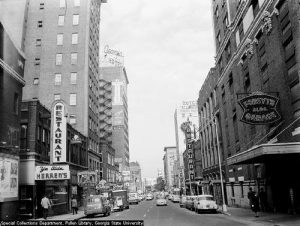 In 1981, the success of the Theatre inspired a group of Atlanta professionals to form a board of directors who helped the Outfit renovate the historic Kress Five and Dime Store at 1012 Peachtree Street, creating a 200-seat, black-box theater. In the mid-1980s, Sharon Levy, Producing Artistic Director, spearheaded more than forty plays and musicals, helping cement the Theatre’s place in the Atlanta arts landscape. Levy was instrumental in bringing Lee Breuer’s productions of Mabou Mines’ Lear and Cold Harbor to the Outfit. Beginning in 1989, under the artistic leadership of Eddie Levi Lee and Philip DePoy, the Outfit’s outstanding productions included Beowulf; The Edgar Allen Poe Festival; a new translation of No Exit; Angels; Tent Meeting and I Dream of Peace, in collaboration with The Carter Center and The Atlanta Committee for UNICEF that told the stories of Bosnian war children. The Outfit began performing at 14th Street Playhouse in the mid-1990s, and shortly thereafter hired Tom Key as Artistic Director. Key moved Theatrical Outfit downtown to the Rialto Center for the Arts in 1999, and in 2005 led the Company through the creation of its award-winning downtown home, the Balzer Theater at Herren’s. The Balzer Theater is the historical site of Herren’s, the first restaurant in Atlanta to voluntarily desegregate in 1962, and is the first U.S. theater to achieve LEED certification from the U.S. Green Building Council. Key’s programming of classics, regional and world premieres, and musicals tell soul-stirring stories, with themes that explore diversity, equality, ethnicity, race, and faith; and often feature the best writers of the American South, including Ernest Gaines, Lauren Gunderson, Horton Foote, Harper Lee, Flannery O’Connor, Janece Shaffer, Sherry Shephard-Massat, Elyzabeth Gregory Wilder, and Tennessee Williams. After ten years of capital investment, the Outfit is in new territory. Having retired its mortgage, the staff, trustees, and artists have launched a new 2018-2020 Strategic Plan designed around five pillars: produce great art; diversify and grow our audience; increase revenue and reserves; develop artists who contribute to the dramatic canon; and maintain an effective organization. Let milk come to a boil in heavy saucepan. Add butter, sugar and salt. Cool. Soften yeast in ¼ cup warm water and stir into first mixture. Add flour, about half at a time, and beat well. Turn out on a floured board, allow to sit for 15 minutes, then knead until smooth. Place dough in a buttered bowl, cover with a cloth and let rise until double in size. Roll out dough about ¼ inch thick on a floured board and cut into roughly 8-inch squares. Working one square at a time, brush with melted butter and sprinkle cinnamon and sugar mixture generously over entire surface. Starting at one side of the square, roll up into a tube. Continue rolling tube back and forth, stretching it sideways until it is 12 to 16 inches long. Cut tube into wheels approximately ½ inch wide. (Note: as this recipe will make 60 to 80 sweet rolls, use three or four small [6-inch to 8-inch] aluminum pans. This will allow you to stagger cooking during your dinner or refrigerate to bake for breakfast.) Place sweet rolls in pan that has been thoroughly buttered and coated with sugar/cinnamon mixture, so they touch, but don’t over-pack. Brush top with melted butter sprinkle generously with sugar/cinnamon mixture over entire surface. Let stand at room temperature for one hour to rise. Please note that you have ended up with a confection of butter, sugar, and cinnamon, separated by a thin bit of dough. Bake 18 to 20 minutes at 350 degrees. You may substitute your favorite yeast dough recipe or buy frozen dough from your supermarket. Minus the sugar, cinnamon and butter, the dough can be used for Parker House or other dinner rolls.